36 HOURS is a fairly intriguing 1965 what-if story that remains little known despite starring James Garner, Rod Taylor and Eva Marie Saint. Might be because this WW2 suspenser was too money-conscious and was shot in black & white. The budget and small scale action seems more in keeping with a made-for-TV film. Color was dominating the big screen when this came and went: it most likely would have made a bigger splash if the effective exteriors (areas around Yosemite National Park posing as Bavaria, and a brief dip into Lisbon, Portugal) had been better showcased. From “Beware Of The Dog”, a story by Roald Dahl, it spins its web around an American officer kidnapped by the Germans. They dope him up and concoct an elaborate plan to convince him he has amnesia, so as to extract invasion plans he’s privy to. It’s rather a stretch, but Garner and especially Taylor are very good, while Werner Peters has another menacing turn as a slimy Gestapo agent. 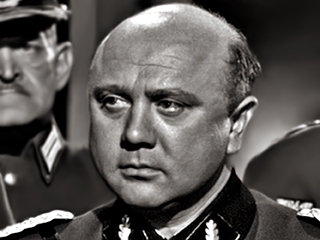 Bald and rotund, Peters had a corner on vile Nazis for a few years internationally— Battle of the Bulge, The Counterfeit Traitor, Blue Light—along with a more varied and quite successful career back in Germany. Small roles are handled by Alan Napier and John Banner; blink and you’ll miss James Doohan and Roy Jenson. Helping it move along for 115 minutes is Dimitri Tiomkin’s score, adding some of his distinctive signature flourishes, quietly exciting. Directed by George Seaton, it brought in around $5,900,000 on home turf, 48th place that year.